One of the most exciting dive sites in the Florida Keys is also among the most recent. The Gen. Hoyt S. Vandenberg was sunk several years ago in 2009 for diving enthusiasts to explore. This large military transport and missile-tracking ship measures nearly 525 feet in length and 100 feet in height after sinking. The ship was featured in the 1999 film "Virus," which included an explosive sequence where a large radar dish was blasted apart by a laser from space. 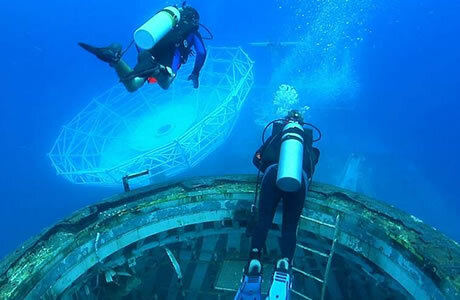 Divers will discover that the radar dish is of course still intact, along with many other intriguing details of the ship such as a telescope in the wheelhouse. Before the Vandenberg was sunk, she was rusting away above the water. Now she is providing a home to the sea life off of Key West. The dive is recommended for divers of all levels, but many past visitors say that the Vandenberg is best for advanced divers or new divers who are at least accompanied by an advanced diver. If you and everyone in your dive group is relatively new to diving, you may want to pick up a little additional training before heading out. The dive is not too challenging, however, and there is a lot to see and do while you are visiting the wreck. The water is very clear, and if you are trained in penetration, you can explore a number of rooms inside the ship itself. Even if you cannot go inside, you will find plenty to explore on the exterior of the ship. At this point there still is not that much in the way of coral and sea life on the ship since the wreck is only a few years old, but you will still probably spot some exciting specimens during your time underwater.